It was early morning as I made my way up the steep trail to the top of Dead Womans Pass, 13,779 feet above sea level. My breath was coming in short, loud rasps and my heartbeat was pounding in my ears. Looking up, I could see several runners on the trail ahead of me. I was approximately 13 kilometers into the 46-kilometer Inca Trail Marathon. A native of Peru now living in Los Angeles, Devy has been guiding runners and trekkers in the Andes for the past three years. 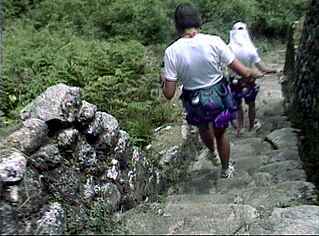 While visiting Cusco in 1995, Devy, a talented ultrarunner, decided to run the Inca Trail to Machu Picchu in one day. That run gave birth to the Southern Andes Adventure Run, a tour he now leads several times a year. Besides the one-day run to Machu Picchu, the tour includes several shorter runs around Cusco, plus a multiday run on trails in a high and remote mountain range south of Cusco. Unlike the other participants lined up at the start, I knew what lay ahead. The previous summer, I had walked this same route as part of a trekking group, also led by Devy. Our group took three days to cover the same distance that we would be doing in one day. The route is challenging. The trail is rough and stony, and features many steep ascents and descents. Altitude is definitely a factor. The race starts at 8,000 feet, and there are three high passes that must be crossed: Dead Womans Pass (13,779); the pass above the Runkuraqay ruins (13,100); and the pass above the Phuyupatamarca ruins (11,939). 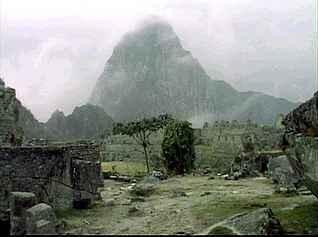 The altitude at the finish line at Machu Picchu is 7,872 feet. Weather can also be a factor. Temperatures can range from below freezing in the high passes, to the 80s and 90s in the tropical forest near Machu Picchu. We had completed two short runs in the preceding days to acclimate ourselves to the altitude. The first run went primarily downhill for about 10 kilometers, and included a stop to explore a large community-owned salt mine. The second was a nine-kilometer run along the Urubamba River to our campsite at Llaqtapata. The elevation on these runs ranged between 8,000 and 11,000 feet. Shortness of breath and heavy legs were a common experience on both of these runs. There were seventeen of us in the race, ten men and seven women. We were a diverse bunch, ranging in age from 25 to 64, and our ranks included a homicide detective, an eccentric German scientist, a newspaper copy editor, and even a professional gardener. But we all shared a common passion, and that of course was running. We had all come to this remote corner of the world to participate in one of the most unique events in running. And now it was time to start. 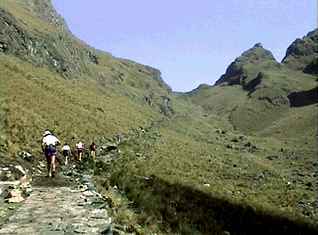 The first part of the race would take us seven kilometers from our campsite at Llaqtapata to a significant turn in the trail at the small village of Wayllabamba. As though on cue, a rooster at a nearby farm house crowed as Devy gave the command to start. It was just after 5:00 AM. Flashlights on, we headed off into the gloom. After crossing a small stream, we reached the Inca Trail and started our first climb of the day. Since I speak Spanish and was familiar with the route, I agreed to carry a radio and act as a guide for the mid-pack racers. Devy would stay with the leaders, and Eddy Pizzaro, a licensed guide and experienced high altitude trail runner, would follow the tail-enders. Most of the time the route is easy to follow, but there are a couple of places where people could go off course, as we would find out later in the day. Besides the radio, I was carrying a significant amount of videotape recording equipment in order to produce a documentary about the event. Starting up the first climb, I was quickly out of breath and felt as though my body weight had doubled. I knew I was in for a long day. The trail soon flattened out as it paralleled the Cusichaca River, and the faster runners disappeared ahead. Our only casualty of the day occurred about three kilometers into the race. Debra Lovci, a professional extreme skier from Utah, sprained her ankle trying to avoid a viciously barking dog that charged out of the darkness. Ignoring the pain, she continued on. Upon reaching the tiny village of Wayllabamba (9,100) we crossed the swiftly flowing Wayllabamba River and made a sharp turn to the right. Devy had posted a porter on the other side of the bridge. Runners who missed this turn would wind on another trail and be miles off course. The porter checked our names off his list, then pointed out the correct trail. We now faced a climb of 4,600 feet in just nine kilometers to reach the top of the Dead Womans Pass (13,779). Legend has it that a woman perished from exposure at the top of the pass during a blinding snowstorm, hence the name. The steeply rising trail winds its way through brushy scrub, and then into a beautiful cloud forest. Within the cloud forest, the trail is steep and rocky, but huge ferns and mosses hanging from the trees give the place a fairy-tale feeling. After leaving the cloud forest, the trees are replaced by a tough grass known locally as puna. I didnt run a single step from Wayllabamba to the top of the pass. It took all of my effort to just keep moving ahead. I set up a pattern of power walking for several minutes, resting briefly while looking around or videotaping, then power walking again. I repeated this cycle until I finally reached the top. From the top of the pass the view back down the trail was stunning. The weather was clear and warm, and I paused to videotape some of the other runners as they worked their way up the trail. Turning and looking ahead, I could follow the thin line of the trail as it snaked down to the river more than a thousand feet below. I could barely make out a couple of runners starting the long climb up from the river to the top of the next pass about four kilometers away. 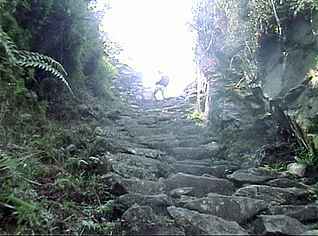 Leaving Dead Womans Pass, we encountered the first flights of stone steps that are a feature of the Inca Trail. Running down these stairways requires total concentration, since none of the steps are the same height. A misstep could result in a very serious fall. Regardless, it felt good to be running again after the long uphill climb. After a descent of more than a thousand feet, we reached the first aid station. We gratefully ate some food while a friendly porter filled our water bottles. From the aid station, we started the second tough climb of the day. At one point, as I was gasping my way up a particularly steep section, a porter carrying a huge load on his back passed me. He was a small man, and was shod in a pair of sandals made from old car tires. As he passed by, he nodded and smiled at me. I smiled back, acknowledging the better man. There are some very, very tough people in these mountains. In the time it took me to reach the top of the pass (13,100), all of the other runners had disappeared from view. Since I hadnt passed any of them, I knew I was falling behind. The only people at the summit were a large contingent of French students. I was astonished that all of them were smoking! The trail plunges downhill from the top of the pass. Clouds had risen out of the next valley, creating a surreal landscape of soft grays and greens. As I ran down the trail, I could make out the castle-like ruins of Sayacmarca (12,234). I have seen a number of translations of the Quechua Indian word Sayacmarca. Variously, I have seen Secret Town, Dominant Town, and Inaccessible Town ascribed to that word. Whatever the word actually means, it meant to me that I had covered 23 kilometers of the race--about halfway. It had taken me nearly five hours to cover that distance, but I knew that from here the route was much easier. I quickly ran past the steep staircase that leads up to the ruins, and waved at a group of Japanese teenagers as they cheered me on. Below Sayacmarca, the trail drops away into a lush cloud forest, then levels out before making the gentle four-kilometer climb to the third pass. 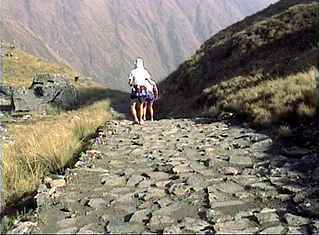 This is one of the most beautiful sections of the route, and if forms a remnant of the ancient Inca Road. The road is on a raised causeway over marshy ground, and is paved with smooth stones. Beautiful mosses and ferns line the way. At times, the trail winds next to sheer drops that spill thousands of feet down to the Urubamba River in the valley below. Devy had an aid station set up at the top of the pass (11,939). I stopped long enough to eat a sandwich and refill my water bottles. I was now only 13 kilometers from Machu Picchu, and I had made good time on the last section of trail. Just before I left, Elena Sherman, a chemist originally from Czechoslovakia, and her partner, Scott Sullivan, a software engineer from California, arrived at the aid station. When they were ready, we headed down the trail together. As we ran through the ruins of Phuyupatamarca, or Town in the Clouds, we passed by the ritual baths that were used in purification rites centuries ago. These baths are still in working order. Leaving the ruins, we were faced with the daunting task of working our way down a long series of stone steps. It has been claimed that there are 1,300 steps in this section of the trail. I lost count after the first hundred or so, but the number claimed seems realistic to me. Once the steps are conquered, the trail enters another cloud forest. It winds gently downhill until reaching the only ugly section of the Inca Trail. Emerging from the forest, the trail comes upon a large clear-cut area, complete with power-line towers marching up the steep slopes from the power generating plant beside the river. In the distance directly below, the red tiled roof of a government-run hostel can be seen. We would dub this edifice the Ugly Hotel. By now, the sun was out and it was very warm. The trail turned into a series of steep, dusty switchbacks snaking down toward the Ugly Hotel. The loose soil was slippery underfoot, and care had to be taken when rounding corners. After what seemed to be an eternity of running on the switchbacks, I reached the Ugly Hotel. I bought a bottle of ice-cold coke, sat down and thoroughly enjoyed my drink. From here, it was only six kilometers to the finish line. I worked my way through a confusing maze of campsites and side trails to get back to the Inca Trail. A large gate a short distance from the hostel blocks the trail. This gate is locked in the evening to prevent trekkers from camping at Machu Picchu. A guard at the gate asked me if I was in the race. I replied that I was, and he let me through. The trail winds through a lush tropical forest for the next two kilometers. It was like running through a leafy green tunnel. After 20 minutes of running I reached the final obstacle, a nearly vertical staircase of steep rock steps. I stopped and let a heavily burdened porter go up ahead of me. When he disappeared into the sun at the top of the stairs, I started up. As I stepped up on the first stair, my leg was seized in a vice-like cramp. I quickly massaged the cramped muscle until it released, then furiously assaulted the stairs. Reaching the top, I stopped long enough to regain my breath, then power-walked up the trail toward the Sun Gate. About halfway there, I monitored a radio call from Eddie to Devy stating that Mary and Dave were apparently lost. Listening to the excited exchange in Spanish, I gleaned that Eddie had lost sight of them near the Ugly Hotel. True joy is experienced upon reaching the Sun Gate, or Inti Punku in the Quechua language. Below lies the famous Lost City of the Incas, Machu Picchu. From the Sun Gate, the trail leads downwards for a kilometer before reaching the buildings within the archeological site. I followed the paths between the reconstructed buildings until I saw the path to the main entrance. I stopped briefly to pull a wheezing, overweight tourist up the final steep step of a stairway. He was blocking my way. Had I been a chasqui, a runner who carried messages from town-to-town in Inca times, I would have been carrying a message or a gift for a king. I didnt have either of those items, but I did have the ticket that Devy had given me. Without it, I would have to pay an entrance fee to exit the site. A cheerful attendant stamped my ticket, and pointed me toward the exit. Once through the exit, I frantically looked around for a sign of the finish line. I didnt see one, but I did see Jeanne Christie and Larry Dehoff in line for the bus down to Augas Calientes. They waved and told me I was done. That night, we celebrated our accomplishment with a dinner in a restaurant in Aguas Calientes, We still had another week of running ahead of us, but the memory of this run would stay with us forever.